Kaspersky Lab has enjoyed a strong reputation in the antivirus and internet security markets for many years and 2015's offering does not disappoint for the most part. System impact a little on the high side. Another antivirus with a strong reputation gained over many years, Kaspersky Anti-virus promises much. In my testing Kaspersky Anti-virus 2016 used very small amounts of RAM so running close to the wind on that specification may not cause you too many issues. In terms of overall system impact the program was not so kind on an i3 processor running at 1.8 Ghz so I would urge caution if you are thinking of running this program on an older machine. 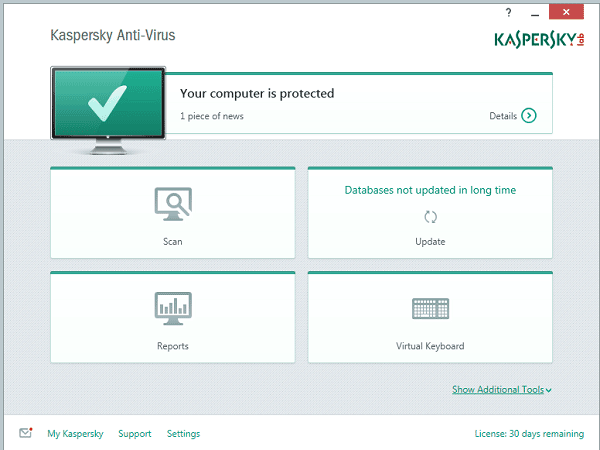 Installation of Kaspersky Anti-virus 2016 is both simple and quick. Unlike some other antivirus programs, the Russian firm’s software can be on your system and ready to go within as little as 3 minutes of clicking on the download link. Why is installation so quick? Quite simply, it’s because Kaspersky choose not to run a quick scan or download any updates as part of the setup process. Whether that’s a good thing or not is a matter of opinion – mine wavers towards a more timely installation process that ends with an antivirus solution that’s good to go and which has already checked the key areas of a system for malware. The other approach, the one Kaspersky has taken, could leave you vulnerable if you choose not to update the database of virus definitions or run a scan soon after installation. Kaspersky’s decision not to implement an update and scan into the installation process appears even more strange when you consider just how quickly it can perform both – your times may vary, depending on number of updates to be downloaded and files to be scanned, but mine took 90 and then 50 seconds respectively. Quite why that couldn’t be built into the install and setup routine I do not know. The interface chosen by the Russian security firm isn’t bad – the grey, white and aqua colour scheme works well enough and the interface makes it clear whether your computer is fully protected via a message at the top of the screen – but it does incorporate some strange design decisions. On the main page Kaspersky Lab proudly displays four large rectangular buttons. One of those is for the scanning function which is fair enough as that is the main feature of this type of software. Other obvious links allow you to update the program, engage a virtual keyboard and read reports. While the latter may be interesting, I can’t imagine many people spending too much time on them. Strangely, some of the other more interesting features, such as the vulnerability scanner, are only discoverable by clicking on a text link beneath the aforementioned and heavily promoted features. Quite why that and other features are seemingly tucked out of view seems curious at least. Removable Drives Scan – for USB drives and suchlike. There is also a Task Manager tab that summarises previously run scans or shows the progress of any scan currently in progress. Again, tucked at the bottom of the page is another link, this time to the program’s settings and scheduling functions. While not exactly invisible it could be missed, at least by first time users, which would be more of a shame than a problem. Beyond providing the opportunity to schedule up future scans, the settings function provides otherwise obscure access to some interesting features such as the ability to choose whether or not the program runs when Windows starts up, or scans email messages. While the defaults favour security over convenience, it is a shame that the settings page is not given more gravitas within the interface. Cloud Protection which shows statistics about the Kaspersky Security Network, an “immediate global threat intelligence” which sends data from all participating users to the company’s Virus Lab, thus facilitating a quick response to newly discovered threats. Quarantine creates a secure area on your hard drive into which the program will place any infected or unknown files. You can decide whether to retrieve anything stored here or delete it permanently. Vulnerability Scan looks for vulnerabilities in both your applications and operating system. On my test system it identified a couple of issues with Internet Explorer (no worries, I never use it) and also suggested disabling Autorun on network and external hard drives. Luckily I did not have an issues with the operating system (all security updates already installed) but knowing the program would have flagged any grants a certain feeling of safety. Browser Configuration will check the major browsers (Internet Explorer, Chrome and Firefox) if installed and will make recommendations based upon their settings. Some areas it looks at are settings that allow programs to run or adverts to appear and changes to the home page. Privacy Cleaner will suggest and then, if desired, execute several changes which will help you maintain your privacy across the internet and from anyone else using the same machine. Examples of what this tool can do include clearing your browser history, emptying out the TEMP folder and disposing of cookies. Kaspersky Rescue disk is actually a link to the internet from which you can download the company’s bootable disk image which should then be transferred onto a CD, DVD or USB stick. Should your PC ever become infected in the future, you can use the disk image to boot up from outside of Windows and clean the infection. There is also a link to Microsoft’s own Windows Troubleshooting wizard as well as a separate link to an included Virtual Keyboard which can be used to thwart keylogging software. All in all, this is quite an impressive list of extra features for what is marketed as a standalone antivirus program. While not quite as extensive as the extras offered by Bitdefender’s equivalent product, the list still boasts significantly more features than that offered by other security vendors. As impressive as the additional tools bundled by Kaspersky are, it is antivirus performance that will be the most important consideration for most people. In that respect, the program performs admirably enough, scoring 100% in three of the four tests run by independent lab AV-Test. The only area in which it dropped a point was protection against real-world 0-day malware attacks. In terms of protection, performance and usability, the program scored top marks, a feat only matched by Bitdefender. At AV-Comparatives, another independent testing lab, the assessment matched that of a great product rather than the best. Kaspersky Anti-virus 2015 picked up silver awards for proactive protection, real-world protection and malware removal and the 2016 version is likely to receive similar accolades. It also bagged two gold awards – for file detection and performance – as well as a top rated product recommendation. All in, a very impressive rating that arguably leaves Kaspersky in second place behind Bitdefender. The way in which a Kaspersky Anti-virus 2015 scan works is a little different to some other antivirus programs. While some will instantly max out as many CPU cores and threads as they can find, and keep them maxed out for the entire scan, this program used a variable level of resources throughout the process. In theory this told me that system performance would probably be better than the competition due to the not always 100% burden on the processor but, in reality, the opposite was different. I definitely noticed a slight element of sluggishness on my system and, to my mind at least, simply opening Chrome into its home page was slightly laggy. Given the low memory usage during the scanning process – only 50 MB of additional RAM was used for the majority of the scan but a leap of another 500 MB was seen temporarily halfway through – this seems like a strange and unexpected result. Given that a full scan took 25 minutes on my relatively unused system, there is a possibility that Kaspersky’s scanning process could become be mildly annoying over time. Talking of full scans, another quirk was the fact that a progress bar estimated the remaining time throughout the process. Handy you may think and, indeed it could be, if only it was accurate – my scan was saying throughout that it was going to take a full hour right up until the 25 minute mark when it suddenly wooshed through to completion. Kaspersky Anti-virus 2016 is a very good program, rated highly by independent labs, and packed with extra features that many of you may find genuinely useful. That it is not quite as highly rated as Bitdefender Antivirus Plus 2016 is a point to note but the margin between them is a fine one, especially given the fact that Kaspersky’s offering does tend to be less expensive. Which of the two is the better match for you may well be a personal choice – functionally they are pretty much the same though some may find Bitdefender easier to use. Whether that warrants the higher cost is up to you to decide. Before I go, there is one last thing to mention – although not really a part of the review per se, I think it is important to mention some recent bad press received by Kaspersky Lab regarding false positives – files identified as being malicious in nature when they are actually benign. Much has been said about Eugevne Kaspersky and the alleged business practices of the company he founded with his ex-wife. At the time of writing nothing has been proven and I personally would say stories about Kaspersky trying to sabotage competitors is complete bunkem. Whatever your own viewpoint – Iain Thomson of The Register offers a balanced view if you are unaware of the story – the fact remains that the software itself is sound and highly rated. So, my advice: don’t be put off by media reports that quote anonymous sources, and don’t fret about Kaspersky being based in Russia – neither are relevant in my opinion.